Could get better, first episode meh. I think this series COULD be fairly interesting. Sure, the main character is a di-(Oh wait no foul language) ...slikeable guy, but I think that he'll get his comeuppance eventually. That grey haired girl seems a little overpowered, though. I really do hope it picks up after the first episode because it didn't really grab my attention. There isn't too much time spent on the other characters, just the jerk, and the somewhat annoying main female lead. And yet, I have a feeling that it will get better. Maybe not the "Anime of the Year", but I think that there is some potential here. I'm going to keep my eye on this series as it progresses, and I suggest you do the same. Plus, the music's pretty da-(Oh wait) ...rn good too. Second episode edit: Ok... Second episode is a swimsuit episode. That didn't take too long. It wasn't a bad episode, and the swimsuits are only there for like, 40% of it. Ok, I am still on board with this show. I like the dynamic between Dislikeable Hero and the Lazy Guy (Sorry I'm bad with names). The relationship between the siblings seems nice too. Second episode didn't scare me away, but I really do hope the series picks up for round 3. Eighth episode edit: HOOOOKAY This series turn a turn. For the better, I mean. Sure, it's a lot more bleak, but I will say I'm FAR more invested than I was. I'm afraid to say any more, because of spoilers, but just know that this show vastly improves as it goes on. This show is not what it seems. Its good, but youre going to have to give it a chance. This is not one of the typical animes you are going to be able to judge just by watching the first set of episodes. The story at first glance seems extremely shallow (Ill admit to that). However, as someone that watched this on a whim; this show...gets real. Like so real that you're going to be looking back on some of the best series of all time and be like "why was this show so good and different from the rest?" Well this show has the story for it and I have to admit, its really really good. Its got me craving for more and I generally don't have that opinion (I am a binge watcher). 1. Good luck getting past the (supposed MC) attitude. And this is 6 MCs not just 1 or 2 as the anime is a collaboration of 3 separate stories into 1 (being the anime). I was like everyone else, turned off by a angry arragant MC, but the other characters are unique in their own way and help build it along. Heck you practically get every kind of MC in 1 go. 2. Animation quality seems...a little cheap in some areas. You expect big showy crazy animations...but sometimes the animators just laugh at you and just go...this is your climax. Youll see it really soon. TL;DR. This show needs you to give it a chance. Watching only the first 3 is NOT going to help you determine if this is good. I am avoiding saying a specific episode # to ensure I don't spoil anything. But, this is going to be a anime that you dont get very often. I only give it a 4 because of the animation preventing me from giving it a 5. This anime has the potential to be something great. So far we have the main character who thinks he is powerful but really isn't. He has a childhood friend who is his 2nd in command that he could not protect when he was little. Please make no mistake THIS IS NOT A HAREM. The girls are not attracted to him except for his 2nd in command and they group does not get along at all. They probably will eventually all respect him and him respecting each of them but they will not fall in love with him and him not fall in love with any of the others. With being invaded by enemies they do not understand and being on the losing side so far they are just trying to get by. The anime so far is interesting and looks to be getting more action related. I'm willing to give the anime attention since it so far hasn't disappointed. For those who don't know unlike many other reviewers I try not to compare anime's and I do not set such high expectations for shows either. This allows me to be more unbiased in my reviews. Finished the Anime, yup all 12 episodes, not one, but aaaaall 12! This review is after watching the whole 12 episodes...I feel like this Anime was given too much of a hit considering how good I thought it was, but I guess to each their own right? I'm not going to give it a full 5 stars though, because quite frankly there isn't many series out there that deserves a full 5 star review. With that being said I think that this series was pretty damn good! I thought it was another cliche Anime with kids and powers, but they actually had a little fling to it! I think our race as Humans have become so spoiled with the amount of Anime that gets pushed out nowadays that we become maliciously cynical and just outright slander any show due to the plethora of options we are given. 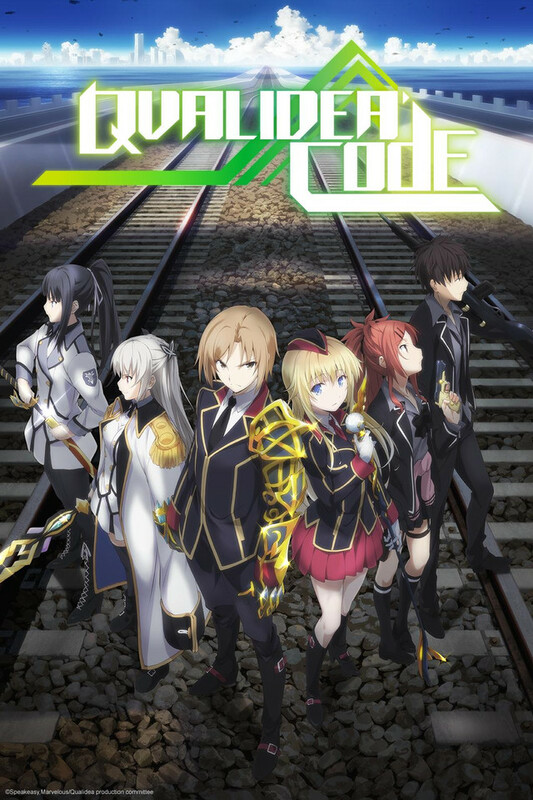 So if you haven't watched this show I do recommend it, it's fun, it's action packed, full of awesome characters, and a creative story, but please begin watching it with an opened mind. The story evolves dramatically over the course of 12 episodes, and while not completely original, it's still compelling and entertaining to watch. The characters are not overly developed by the end of the series, but you'll still have enough time with them to build a connection. The quality of the animation is okay, however several scenes occur with the action off camera, which was jarring and took away from the overall viewing experience. Sloppy animating is some scenes was noticeable but not completely distracting. I really would have preferred this ran for 25 episodes and drew out the story, giving us some greater detail into the history of the world, as well as some better explanation in the second half of the season as to what had actually been occurring during the first half. I was quite confused as to what the giant round 'boss' they fought early on actually was, and I did not understand completely what the 'False Unknown's' that were capturing the kids were - I really feel this is the only major weak point of the show, otherwise it was a great watch. The first couple of episodes were interesting and you could see a hint of potential. Unfortunately with every new episode it just started loosing steam. They just never truly explain the what and how of the enemy and their interest on Planet earth. By watching the last episode it was clear that they rushed it since they hadn't touched certain topics and that made it into a simple battle for the protagonist. This show was a disappointment and clearly had the material to be developed into a more comprehensible and entertaining anime. The premise sounds cliched and it is kinda but what others have said about watching it more than a few episodes is true. Keep watching it and you'll find the plot isn't quite what you thought it was. However, in the end this is a "Meh" show. Yes the characters are varied and heck there's even some growth here and there and the romances actually go somewhere! But! and that's a big BUT there and it's cause the ending is just...well you'll see. Obviously a simple, one shot, yet interesting anime but that's all it is. This series had a lot of high end potential which shines in the whole series, yet the only thing it truly lacked was a more in depth story and possibly a longer series to explain things. It seemed to me that there was several hang-ups on the story which could have been brought to a head in the end as well. Other then that it was a really nice series and I would watch it again just for the sake of enjoying the music and the interesting animations. A story of meeting expectations. This is not a "bad" anime. This is also not a "good" anime. It has some good points and a couple of surprises along the way, but it also has some bad character writing at times and that causes some of the more emotional scenes to fall flat. In other words if your expectations are not very high going in, you will find them satisfactorily met by the last episode. The story has it's moments, there is legitimate tension and mystery as the story moves into the middle episodes but the writing often falls short of the premise. As a result you will either drop this by the second episode, or watch it to the end to see where it all goes. There is no defined "main character" and that works for and against the show at different times, but the core six characters each are interesting enough to take the focus for a time. The secondary cast members are likable enough but no one you would probably get overly attached too. In all this anime is a good example of an interesting story told poorly. Given that this appears to be a run of the mill adaption of the source material (from my understanding it was several light novels about the same events told from different points of view that were merged into one total story for the anime) the end result is about what you may expect. Ok so I thought this was going to be a regular super power teen anime. As the story has progressed the plot has become much more interesting. I'm glad I've stuck around for this one. I don't want to get into the finer details but when you start to wonder what is actually going on then I consider it a good anime. Don't skip this one.